Signia is a relatively new hearing aid brand which emphasized high-end hearing aids and innovative designs. However, while the hearing aid brand is new, Signia is part of the Sivantos Group, which has been focused on correcting hearing loss for over 130 years. Here at Hearing Associates of Las Vegas, we carry a wide variety of hearing aid brands, including Signia. To give you an idea of what hearing aids are available from Signia, we have highlighted their top hearing aids. There can be a stigma attached to hearing aids, namely, that they are unattractive and made for seniors who don’t care about fashion. While this assertion is untrue, Signia has decided to approach this stereotype head-on and have produced the fashion-forward Styletto. With brushed metal in three different colors and a slim, redesigned case, this Receiver-In-Canal (RIC) hearing aid comes with the ability to recharge them by using a portable recharger so you can always hear on the go. 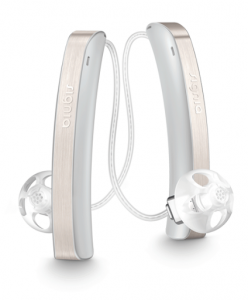 It is meant to help those with mild to moderate hearing loss. The Styletto hearing aids also come with sync with multiple apps such as myHearing app to talk to our hearing specialist remotely, and the touchControl app to make changes to the hearing aids programming. The Motion Charge&Go Nx is another rechargeable hearing aid from Signia in the Behind-The-Ear (BTE) style of hearing aids. You can choose from 11 different colors for your casing, and you can use the myControl app to adjust the hearing programs on the Motion Charge&Go Nx. Thanks to its powerful style, the Motion Charge&Go Nx can help correct hearing loss from mild to severe. Also, you can stream Apple device media directly to your hearing aids thanks to its built-in Bluetooth. 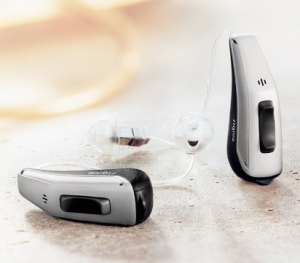 Choose from In-The-Ear/In-The-Canal style hearing aids when you choose the Insio Nx. 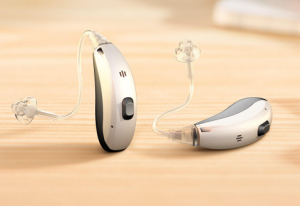 Even in these small hearing aids, the Insio Nx have Bluetooth built in so you can directly audio media stream to them. You can also use a dedicated button on the Insio Nx to manually cycle through the various hearing programs. There are five colors to choose from so you can make these hearing aids blend in better with your skin tone. Also, these hearing aids are powerful enough to assist with hearing loss ranging from mild to severe. If you have been interested in smaller hearing aids but are concerned that they would be difficult to adjust, the Silk Nx can sync with the touchControl app which adjusts your hearing aids from your smartphone. There are also different silicone sleeve sizes which you can put on the Silk Nx to customize its insertion sleeve to a more comfortable fit. There are two color variants to choose from when it comes from the faceplate, though one will always be red and the other blue to make putting the right one in the correct ear easier. Also, for those with single-sided hearing loss, the Silk Nx can come in CROS. 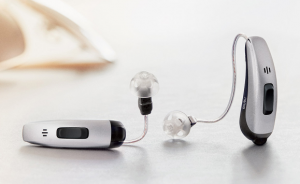 Described by Signia as appropriate for all levels of hearing loss (except profound), the Insio Invisible-In-Canal/Completely-In-Canal hearing aids are the smallest ones available from this brand. 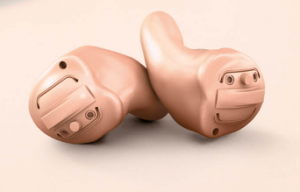 Due to their placement in the ear, each Insio is tailor-made for your ear. Depending on whether you choose the IIC or CIC style of Insio, you will have four different color variations to choose from. Also, even these tiny hearing aids can be paired with the touchControl app to give you greater control over the sound program. 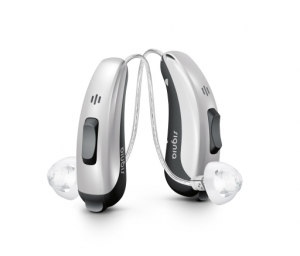 Another rechargeable style of hearing aid, the Pure Charge&Go Nx works for mild to severe hearing loss. Thanks to its strong battery, you can stream audio media to your hearing aids for longer than a disposable battery-operated hearing aid. Also, the Pure Charge&Go Nx pairs with the myControl app to make a variety of sound program adjustments to your hearing aids. There are 11 color options when you choose these hearing aids. You can learn to become used to them sooner when you use the myHearing app, which teaches you listening strategies, provides a user guide, and allows you to remotely connect with our hearing specialist. 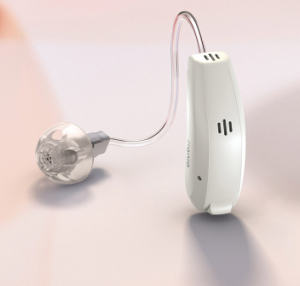 A mini BTE hearing aid, the Pure 10 Nx has a smooth, uninterrupted case which makes it sit more invisibly behind your ear. Depending on which of the 11 colors you choose from, you can blend this hearing aid in more completely without sacrificing power, as it can assist those with hearing loss ranging from mild to severe. With an emphasis on natural sound, the Pure 10 Nx can be controlled by the touchControl app, allowing you to adjust the listening program within the hearing aids. 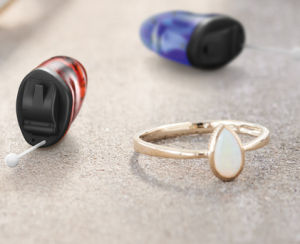 Like others in the Signia Pure series hearing aids, the Pure 312 Nx emphasizes natural sound clarity inside of sleek packaging. 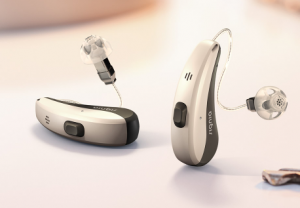 It is also for mild to severe hearing loss and also has tech built into it to allow you to use the myControl app to personalize your hearing aids sound profile. There are 11 color options available, some of which make the entire hearing aid the same color, making it stand out less. 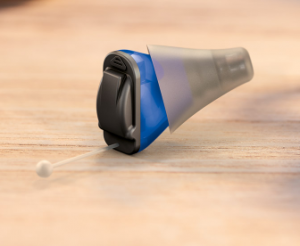 Providing assistance for mild, moderate, and severe hearing loss, the Pure 13 Nx has Bluetooth built into it for audio streaming from smartphones as well as other media devices with streaming. There are 11 color options and can also be controlled with the myControl app to adjust sound settings. Should you only have hearing loss in one ear, Signia’s CROS Nx products include the CROS Pure 312 which are a BTE style hearing aid or the CROS Silk NX, a CIC style of hearing aid. What features they come with is dependent on which style of hearing aid you are interested in, which our hearing instrument specialist can help you choose. If you are interested in Signia hearing aids but don’t know where to start, come visit us at Hearing Associates of Las Vegas. Along with receiving a complimentary hearing test, our hearing specialists can consult with you to help you determine which hearing aids best suit your level of hearing loss and lifestyle. You can even test out hearing aids before you commit to a purchase. So, if you are ready to take control of your hearing, contact us today for an appointment with one of our hearing specialist.